Last Saturday as I was figuring out our weekly meal plan I expressed frustration to my husband regarding the lack of fish in our diet. I love fish! I have always loved fish. Before I got married I ate fish or shell fish at least twice a week. My husband however, grew up in Kansas...land of meat and potatoes. He claims the only fish he was ever exposed to came off the menu of Long John Silvers or out of a can of Starkist. Obviously he never developed a taste for anything from the gilled culinary persuasion. But...surprise, surprise...his response to my complaints..."Let's try some fish." He has never said that to me before, and this isn't the first time I've complained about my Omega 3 deficiency. He suggested that maybe he could develop a taste for it, with increased exposure and if it were cooked with yummy flavors he already liked. So we tried it this week...the recipe below. I'm happy to report...He liked it, he liked it. It's a miracle! I just may get fish back in my diet after all. 1. In a small bowl, combine the first five ingredients; mix well. 2. Remove 1/2 cup of the mixture to a saucepan; simmer until heated through. 3. Set aside remaining mixture for basting. 4. Sprinkle salmon with lemon-pepper and salt. 5. Place on a piece of tin foil, then on the grill. 6. Grill, covered, over medium heat for 5 minutes. Brush with the reserved brown sugar mixture. 7. 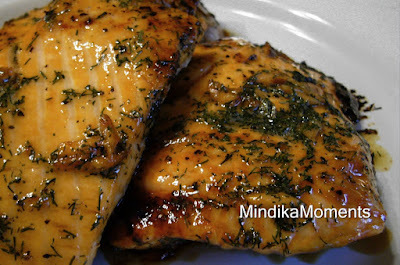 Grill 10-15 minutes longer, basting occasionally, until fish flakes easily with a fork. 8. Serve with the warmed sauce. This isn't exactly the arrangements we made when we were in high school (we were going to live next door to each other and you were going to cook for me), but it's pretty good. Thanks for sharing your great recipes. Brigham says thanks, too!